All Zebra skins available at below market prices. areas other than the U.S. will be quoted upon request. Zebra Hides are returnable (within two weeks) if not satisfied. Our zebra skins are beautiful. See Feed-back Page on our web site for customer comment. All Zebra skins/rugs are shipped to the customer from Virginia, USA . All licenses, shipping and Custom/Fish & Game charges from Africa have been paid by R&R Traders Import/Export and are included in prices listed. Only UPS charges from Virginia to the Customer are added. GRADE "A Plus" Zebra Skin hides and Rugs are culled from private estate herds and hand selected. 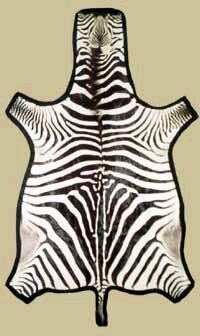 GRADE "A" Zebra skin rugs are "superior", top quality hides and rugs. GRADE "B" Zebra skin rugs are of an "excellent" quality. GRADE "C" Zebra skin rugs are "good" quality with some unnoticeable blemishes. These rugs can still be displayed and their beauty enjoyed.